Tonight (Wednesday), IAF fighter jets, attack helicopters, and aircraft struck 25 military targets belonging to the Hamas terror organization in the Gaza Strip. The target strikes included sheds of drones used for terror purposes, a rocket manufacturing workshop, advanced naval weaponry, military compounds, training facilities, and a munitions manufacturing site. This is an additional strike against military targets belonging to the Hamas terror organization, which is accountable for activity from the Gaza Strip, and therefore is responsible for the severe attacks that were carried out against Israeli civilians. The Hamas terror organization again chooses to act against the interest of the residents of the Gaza Strip. After it failed during the violent riots along the security fence, it now chooses to conduct and allow a wide-scale attack against Israeli civilians. 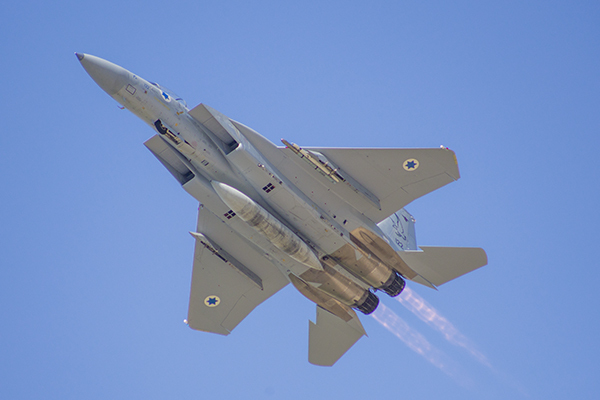 Yestrday (Tuesday), the IAF attacked over 35 terrorist targets in seven terrorist structures belonging to the Hamas and the Palestinian Islamic Jihad Movement in the Gaza Strip using IAF fighter jets and other various aircraft. Six military structures were attacked, including ammunition depots, naval targets and terrorist command centers. As part of the attack, an offensive Hamas terrorist tunnel in the Kerem Shalom area was neutralized. The tunnel originated in the Gaza Strip, infiltrated Egypt and then crossed into Israel's territory. The tunnel had two functions: terrorist activity and transferring of munitions into Egypt's territory. The tunnel was detected during its establishment near the Kerem Shalom passage, which acted as a trade path for civilians in the Gaza Strip. This is the second tunnel neutralized in the area, and the tenth since last October. The attacks were performed following Palestinian Islamic Jihad Movement mortar strikes on Israeli villages in the Gaza envelope. This is a severe, dangerous terrorist act aimed at civilians and children. The Palestinian Islamic Jihad Movement is a terrorist organization based on Iranian ideology and funds. As part of ysterday's attack on Israel's territory, Iranian munitions were used. "How the following days will look after this event, which is the most severe since Operation 'Protective Edge', is the Hamas terrorist organization's choice", said IDF Spokesperson Ronen Manelis. "The organization decided to continue firing, and we know that in the past it managed to contain itself. A terrorist organization firing on villages is unacceptable". "We have been attacking in the Gaza Strip from 12PM, a series of attacks the likes of which haven't been seen in a long while", said the IDF Spokesperson. "We attacked over 30 terrorist targets along the Gaza Strip in broad daylight – including the city and the center of the strip. The targeted structures included outposts, command centers, ammunition depots and a Hamas terrorist tunnel in the southern part of the Gaza Strip. The detected target originated in the Kerem Shalom area. It crossed one kilometer into Egypt, and then 900 meters into Israel's territory. This is the tenth tunnel destroyed in the Gaza Strip, and it was destroyed during its establishment. A number of additional firing events occurred over the past few years in response to our widescale attack. The 'Iron Dome' weapon system intercepted mortar bombs, but it's important to specify that our defense is not hermetic, and Israel's citizens have to be attentive and listen for instructions". During recent months, the Hamas terrorist organization has acted with the intention of turning the border into a terror zone, with heightened activity in recent weeks. The IDF will not allow damage to Israel’s security and will continue to act against any terrorist threat with determination. The IDF deems today’s attack severe, and holds the Hamas terrorist organization responsible for all events happening in the Gaza Strip. The IDF will not allow any harm to be caused to Israel’s civilians and will continue to against terror above and below ground. The IDF is prepared for a variety of scenarios and will continue acting towards its mission - defending the people of Israel.